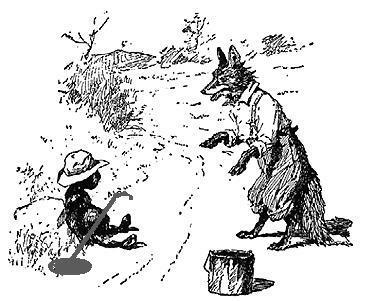 So, one time, Brer Bear and Brer Fox made what was called a “tar baby”. They got some tar and whopped it all together…. “Why must you tar us all with the same brush?“ complains a detectorist. An excellent question. Let us explain: we don’t! Artefact hunting is a very broad church, that’s one thing we can all agree about so just because we complain about intellectual scruffs who steal knowledge it doesn’t mean we complain about everyone. On the other hand, just because you tell yourself and others you don’t steal knowledge it doesn’t mean we have to accept it without question. That’s not tarring with the same brush, it’s proceeding with caution. A few platitudes on a detecting website aren’t enough – sainthood is hard-earned not self-proclaimed, yes? By way of example let’s take at random the Crewe and Nantwich Metal Detecting Society, a typical group who might complain about being tarred with the same brush as irresponsible artefact hunters. They run rallies “for charity” (hooray! ), they don’t hold them on land that is “a scheduled site of archaeological importance” (hooray! ), all their members practice the NCMD code of practice (hooray! ), they verbally mention to the landowner and charity representative details of the day’s finds (hooray!) and at a later stage a report with photographs of the day’s events and finds (hooray!). How could they possibly not be doing something truly beneficial to everyone? 1. Archaeologists (including PAS) are pretty unhappy about the potential archaeological damage from detecting rallies and say running them for charity doesn’t make them any more justifiable. 2. PAS also says: “Landholders and rally organisers should also be aware that there can be considerable cost implications for both PAS and Local Authority staff in ensuring an adequate archaeological response to a rally”. How come that’s not mentioned on the website? 3. Not running rallies on scheduled sites is no big deal (as it’s illegal!) Not doing it on land of archaeological importance would be a big deal but there’s no sign of that. Holding events only where the County Archaeologist confirms it’s OK is the obvious responsible action and yet…. 4. Following the NCMD Code sounds OK but isn’t. It’s completely inferior to the proper, official Code of Responsible Detecting. How come there’s no mention of following that? 5. Verbally mentioning what was found and later sending a photograph …. It hardly needs saying that’s an almighty cheek considering it’s the landowner’s property and it’s potentially to his and the charity’s great disadvantage not to have the finds revealed on the day. 6. There are official, detailed Guidance Notes for organisers of detecting ralliess to minimise the archaeological damage they do. How come there’s not a word about following those? The Crewe and Nantwich metal detecting society is about to hold a rally that will raise £400 for St Michael and All Angels Church in Middlewich and is getting lots of praise for so doing. But does the church understand what that £400 has cost (about £1000 on average to provide archaeological cover and who-knows how much in archaeo-damage and loss to the landowner) and does the club? Are we wrong to suggest the funds would be better raised in another, less damaging way – or not at all – and to reach for the tar bucket? « Stonehenge: a satanic temple?